The soldiers in two planes arrived on Sunday evening at Entebbe airport, 40 km south of Kampala, as the withdrawal, which will last for eight days, will see about 4,000 Ugandan soldiers pull out of northeastern DRC. "It is not a sudden withdrawal, a meeting between President Museveni and President Kabila reviewed the operation and it was prudent that Uganda withdraws," Felix Kulayigye, the spokesman of Uganda People's Defense Force (UPDF) told Xinhua by telephone on his arrival at the airport from DRC. Ugandan President Yoweri Museveni and his Congolese counterpart met earlier this month at a border post in Kasese, western Uganda, to discuss the fate of the operation dominated by UPDF and coordinated by the DRC and southern Sudan. The two leaders, however, kept tight-lipped on the details of the meeting over Operation Lightening Thunder. "Since the capability of the LRA has been weakened, the Congolese army has told us they can now flush out the LRA," said Kulayigye. "We will share intelligence with them as they continue fighting the rebels," he added, noting that Ugandan army will strengthen border security in the meantime to prevent rebel infiltration to Uganda. The withdrawal came before Ugandan army could close in on the rebel leaders hiding in remote bushes in DR Congo after the rebel group suffered substantial losses to the operation. Over 170 rebels were killed and five rebel commanders were captured, including Thomas Kwoyelo, the alleged 4th in rebel command, during the operation, while Ugandan army lost at least six soldiers and one jet fighter. The joint forces said the offensive has been successful and the LRA's days, according to Ugandan army, were 'numbered'. Meanwhile, the operation draws some criticism due to its failure to prevent in retaliation attacks from the rebel group, in which about 900 civilians were slaughtered in DR Congo, though the operation should be given due credit for the rescue of about 350 abductees among others. 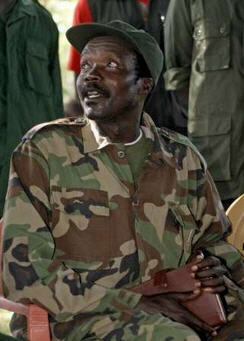 "The only thing we failed to achieve is to force Joseph Kony to sign the peace agreement," said the UPDF spokesman. The joint military operation was launched on December 14 last year after Kony, the LRA's elusive leader, repeatedly refuse to sign an already negotiated peace agreement. Kony along with his three senior commanders were indicted by the International Criminal Court of war crimes and crimes against humanity. The LRA's over two decade insurgency has left tens of thousands of people dead and about two million others displaced in northern Uganda before it spilt into southern Sudan, northeastern DRC and part of Central African Republic.